Team Wash Guys Join ATA's Terrorist Mobile Watch Group. The ATA and Government Agencies were able to put this all together and modify it to use with all Truckers in the US. It is great to see how well industries can adapt when we put our heads together. We will be relentless in our pursuit to win the war on International Terrorism. 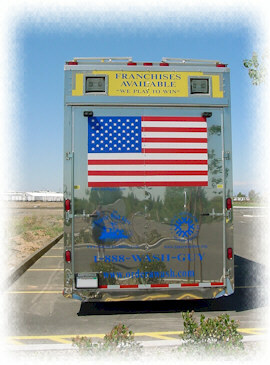 To help kick off this program Team Wash Guys will be traveling to all 48 contiental US states to display the fact that American Truckers mean business. Keep on Truckin' America, we are "With YOU !!!"